Many years ago I worked for a small manufacturing company whose founder and president was a believer. He had hired only other believers (from many different denominations) to work in the office, but outsourced some positions to non-believers. One of these was our chief accountant; a devout Jewish man who was very smart, great fun, and completely baffled about Christians. He had never before met any real believers; his “Christian” acquaintances were nominal Christians who went to church on Christmas and/or Easter (if at all) and felt that was sufficient contact with God for the year. He was astonished that all of us knew so much about the Old Testament. Our sales manager and he often had discussions about the many types and shadows of Christ found in the Old Testament, and he was intrigued. All of us in the office longed (and prayed) for him to be able to see with spiritual eyes. However, although our association continued with much mutual respect and affection for many years, and although he deeply loved the Father, he could never get past the obstacle of Jesus. His upbringing had been filled with mistaken ideas about the nature and beliefs of Christians. Although he was being enlightened by his association with believers, he couldn’t quite disentangle the followers of Jesus who truly loved God and sought to live lives of love, mercy and grace from those who claimed to be Christian yet had spawned the holocaust and other atrocities to the Jews over the centuries… and who could blame him? There is no question. Jesus is a stumbling block, not only to the Jews for their specific reasons, but to others who want to live without the authority of God over their lives. He just doesn’t fit into our idea of a comfortable existence. His ideas are radical. When injustice is done to us, our immediate response as natural men and women is to seek revenge; to set things right by exchanging an eye for an eye. Jesus, on the other hand, calls us to love our enemies and to pray for them. Man in his natural state is angry and rebellious. Other religions are often filled with vengeance. Only in Christianity are people called on to live not only in a passive state of peace with all men, but to love their enemies actively. Without spiritual comprehension, who could be expected to understand this? Jesus specifically came to this world to take upon Himself all the wrath of God and man ~ to suffer and die an ignominious death. Even more importantly, He was sent to suffer the spiritual separation from God which would, by rights, be mine as a consequence of my sin and rejection of the sovereignty of God over my life. Because the Spirit of God has helped me to understand this, I am overwhelmed and grateful to God for His immeasurable grace and mercy. To the worldly man, however, this is irrelevant. If I don’t acknowledge to myself that I am a creature of God and that He has the right to my devotion, then I won’t believe that I am at risk because of my rejection of Him. The sacrifice of Christ will only be a sad footnote of history to me. 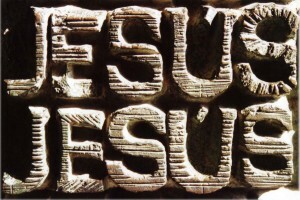 Our whole eternal future hinges on how we answer this question: Who is Jesus? If we believe that He was just another prophet, or a great teacher, or even just another deluded mystic wandering through the towns and hamlets of Palestine 2,000 years ago, then He is irrelevant, and we won’t see that we are gambling with the possibility that we may be wrong, and that our eternal lives are at stake. To those of us who have accepted that He was indeed the Sent One of God, and that His life and death are the ultimate expressions of God’s love and care for us, He is everything. Through Christ, we have access to the Father. Through Christ, we have eternal life and the promise of the Presence of God. Because He left us the Holy Spirit, the Paraclete, we have the constant ear of God. The Comforter is always available to guide us and to translate our deepest longings to the Father. None of this would be possible without the willingness of Jesus to sacrifice Himself for us. God never forces Himself on us. He IS, and He has given us the historical fact of Jesus and the body of scripture which expresses His dealings with man since the Creation. In reading from Genesis to Revelation we see the entire spectrum of “time”; from the beginning to the end. Time, however, is only a little blip in eternity, and prudence would seem to dictate that we need to be concerned more with our eternal destiny than with our three-score and ten. Of course, if you believe that man is just an anomaly of nature on this earth, and that our death is the total end of life for us, it is not a concern. However, if there is any chance that we are more than just biological specimens, mere soul-less throwaways, we have to consider the possibility of the reality of God, and all the implications of that. I am forced to believe in God by the existence of truth and beauty and the reality of goodness. These are not biologic entities; they can only be understood by some internal component which we have labeled a soul. Although they may be subjective, they are proof to me that I am more than just cells and atoms making up a physical mass which will disintegrate and break down after 70-plus years. The fact that I can think and feel and recognize truth and beauty makes me understand that there must be a Creator, that God must actually BE. If we acknowledge God, then we have to deal with the question of Jesus. Once, as an exercise, I wrote down all the names and types of Jesus listed in the scripture that I could remember. These included Almighty, Anchor, Ark, Beautiful, Beloved, Blood, Bread, Bridegroom and on through the alphabet until I had listed over 100. He is Counselor, Deliverer, Emmanuel (God with us). He is Exalted, Faithful, Fortress; Kinsman-Redeemer, Lamb, Priest, Redeemer, Savior. He is the Lord, Son of God; He is the Crucified One. He is central to the entire body of scripture. We see glimpses of Him all through the Old Testament, promised to come to redeem Israel. He is the subject of the entire New Testament in His life, death and resurrection, but also in the legacy of ideas and understanding explained to us by the writers of the Gospels and letters to the new churches by Paul and others. To dismiss Him as irrelevant, given the impact He has had on the entire world since His death, seems to me to be incredibly naïve. Even now, we see evidence of the world moving inexorably toward the conditions which were promised as part of the end times. We may not know when it will happen, whether tomorrow or yet in hundreds of years, but many believers believe that God is at work fulfilling His plans for His Creation, and that what we are seeing is all part of His plan to bring the age to a close. This makes any decision about the identity of Jesus even more imperative. For believers, the question has been answered, and we are satisfied to know that our eternal future is secure in Him. For those who choose to rely on their own understanding, there is still time to consider. I am prepared to fall at His feet and call Him Lord and God. You must make your own decision. I pray you make the right one.